Friday the 13th proved to be unlucky for the SF State women’s soccer team as they fell to rivals Sonoma State 3 – 0 at Cox Stadium. The Gators were thrown into the fire immediately as they opened up the conference play against last year’s CCAA north division champions. Sonoma State ranked 18th in the NCAA Division II preseason poll before dropping out of the top 25 this week. After a scoreless first half, the Gators unraveled in the second, allowing two quick goals from the Seawolves’ Lauren Fryer and Kristal Luna in the first three minutes of the half. Sonoma State’s All-American Cara Curtin added another goal five minutes later. Curtin was the Seawolves’ scoring leader last year with 15 goals—a performance that won her the CCAA Newcomer of the Year award. Sonoma State was the aggressor early as they recorded nine shots in the first half and Curtin constantly pushed the tempo. The Seawolves’ defense kept the Gator’s offense in check all game, SF State generated minimal scoring chances and was held without a shot on goal until the 54-minute mark when Vanni’s attempt was turned away. 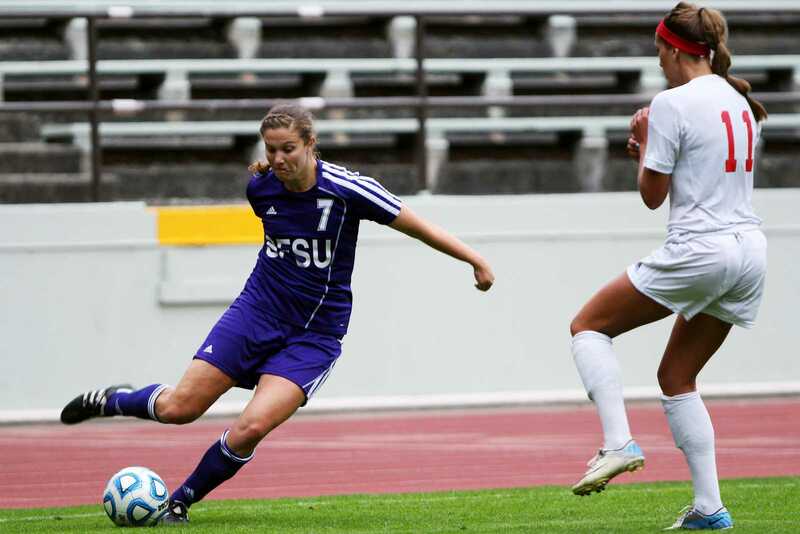 SF State was shut out for the first time this season, managing only three shots on goal. Something had to give when these conference rivals matched up, as both teams came into the game without a loss. Sonoma State entered play with a 2-0 record, while SF State came in 1-0-1. To add injury to insult, junior forward Lauren Floro was carried off the field with less than six minutes remaining in the game holding her left leg. The match against Sonoma State was a part of a grueling stretch of home games. The Gators tied Western Oregon Wednesday Sept. 11 and lost to Humboldt State 0-1 the following Sunday. The team will have a five day resting period before its next game against Cal State L.A. on Sept. 20.